One of the great things about playing to win is that it’s a path of self-improvement that can be measured. 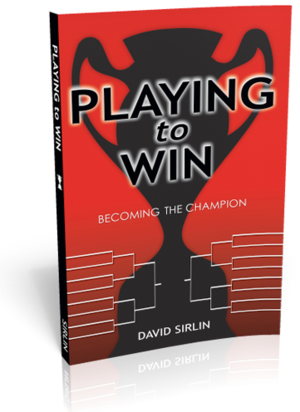 In playing to win, we have the cold, hard results of winning and losing to guide us along that path. I think it’s only useful to consider winning and losing in the context of formal competition such as tournaments. Kicking your opponents in the shins is outside the scope of the game, and is not legal in any reasonable tournament. Likewise, any third party program obtained from an illegal warez site and installed as a hack into your game is also not going to be legal in any reasonable tournament. These things, though technically useful to those trying to win, are outside the path of continuous self-improvement that I’m talking about since they are outside of the rules of tournaments. You should use any tournament legal means to win. If you participate in some strange tournament where all players are allowed to use a map hack, then go for it. You’re playing a rather weird, nonstandard version of the game, though, which defeats the whole purpose of shedding extra rules so as to play the same game as everyone else. Any reasonable person would consider “no cheating from outside the game” to be part of the default rule set of any game.